It's that time of year again, and this time we were fortunate enough to be up in Marin at dusk. We saw the mass starting to form and pulled off the freeway and found a great spot to watch the spectacle. 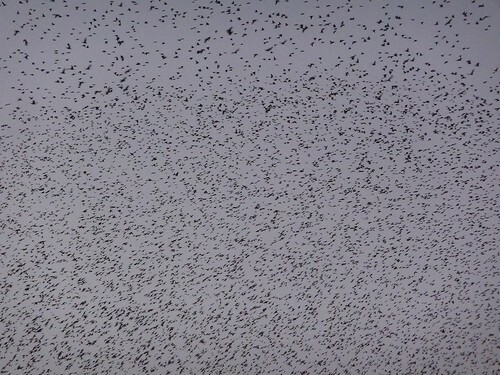 The birds kept arriving and arriving and soon there were tens of thousands of birds, flash-mobbing. Sometimes it looked like fireworks, other times a lava lamp. 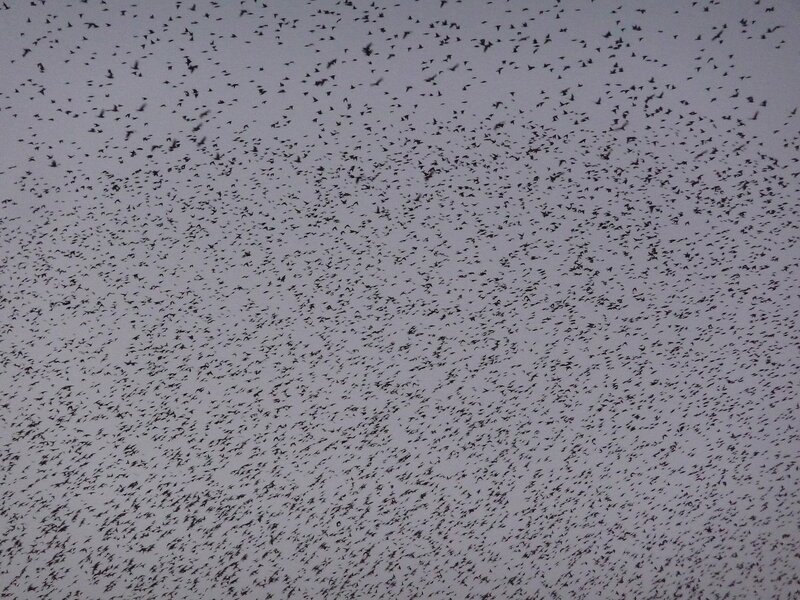 At one point the huge flock swarmed directly over us, and back again. Click Here And Then Pop It To See Detail - Do it! After twenty minutes, as the light diminished, they began dropping into the trees in huge numbers. We could see hundreds at a time drop in at crazy speeds, looking like Cylons attacking the planet off in the distance. The video was shot at the begining of the Madness. And then the sky was empty and darkness washed over the Dude. Beautiful music with the video. They are beautiful in flight, but it's a little creepy. Too many of any animal is creepy. We don't have numbers like that here. When it gets cold they will perch around the top of chimneys, all facing inward, like they've have an important starling meeting. that's quite the site. fluid as water. Wow. What a great thing to witness while driving along. We are out of our element.